Triple H spoke with Sports Illustrated to hype the upcoming WWE Halftime Heat and about New England Patriots player Rob Gronkowski. During this Sunday's Super Bowl halftime, WWE Halftime Heat will air live on the WWE Network featuring NXT Champion Tommaso Ciampa, NXT North American Champion Johnny Gargano, and Adam Cole vs. Ricochet, Aleister Black, and Velveteen Dream. WWE previously did Halftime Heat in 1999 and 200. Most notable, Mankind won the WWE Championship from The Rock in an Empty Arena match. In his talk with SI, Triple H explained why now was the right time to do another show. 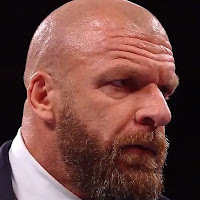 "This is the right time to offer an alternative at halftime and see what we can do," Triple H said. "I know that those six talent will make people's jaws drop open. This will be eye opening. ... Vince is focused on showcasing the future, and he pushed to make this happen. He was the most supportive one. This is a big opportunity to go out, in essence, and perform in front of the world." As the NFL season winds down it's becoming almost tradition for Rob Gronkowski to address if he'll be back for another year in the league or if he'll venture out to Hollywood / WWE. Earlier this month, it was considered unlikely WWE will be in his future. Triple H said he's not sure how serious Gronk is about a WWE run, but "the door is open for him." "Rob is very close with one of our stars, Mojo Rawley," Triple H said. "We've met a few times, and he's actually come down to the Performance Center and even done stuff with us at WrestleMania. He's a great guy, an incredible player, and it's hard not to root for him. I'll be watching him, but that's also because my wife is a massive Patriots fan. Gronk has mentioned WWE before, that he loves it and said had so much fun doing it. I don't know if it's something he'd be seriously interested in, but that's how the conversation started with Ronda Rousey, too. Certainly the door is open for him at WWE."